A thousand or so years ago the Wu family made a successful play for control of the Interdependency—a human interstellar empire connected by Flow (a sort of space conduit)—and named one of their own the religious head of state. Now the conduits are failing and Emperox Grayland II of the Wu family tasks herself with once again providing “visions,” as her predecessor once did, in order to save humanity. There are plenty of people who don’t want to see the Emperox wield her power, however, even if their political maneuverings destroy humanity in the process. 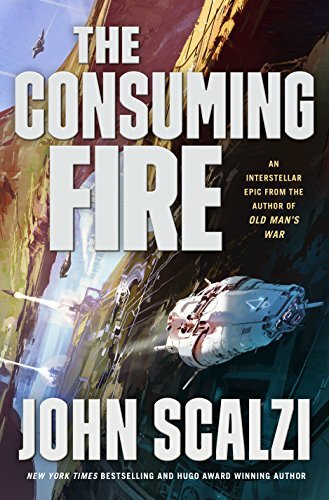 The Consuming Fire is the very best type of space opera that blends the inner workings of social groups with the broader mechanisms of power—along with a strong dash of social commentary. Scalzi’s unique tone shines strongly in this book, mixing far future societies with modern slang and syntax to create worlds that could be happening now, if not for the tech and occasional year reminder. It is thus easy to fall into the narrative and, whenever reminded that this is in fact not the modern era, it is just as easy to slip back into the flow. But not the Flow, of course. Although burdened with more named characters and points of view than most readers will find manageable, Scalzi is no sophomore writer. His handling of POV shifts in a linear scale that moves the narrative forward is deft. Each chapter brings its own excitement, which leaves the reader eager instead of upset at losing the previous POV. Each character is distinct and three-dimensional, and the female characters, in particular, are exceptionally well-rounded. In that same vein, care is given to the evolution of society along current lines, as seen though, among other examples, the involved discussion of the gender neutral “emperox” title. Overall, the societal commentary is very well done and mirrors common recurring trends—personal wealth and power over the good of the whole, in particular. The diatribe on the state of science and peer-review comes off perhaps too heavy handed (“Marce had been genuinely flummoxed by it until he thought back on his days in academia and what the chair of his department had once told him, about colleagues who were bound and determined to relate every new finding to their own area of expertise and that area only.”), but the story of Marce the underdog scientist who finds a long lost civilization is by far the most compelling line in the book. “Hacks” of all sorts, especially universal space opera lovers, will find themselves easily at home with The Consuming Fire. The book is quintessential Scalzi, with enough political commentary, social justice, pew-pew shoot-’em-up, space renegades, and underhanded maneuvering, that no reader will leave empty handed.